← 11/1/10: Luol Deng Activates Beast-Mode. Poster of the Day 11/2/10: McGee on Hawes. 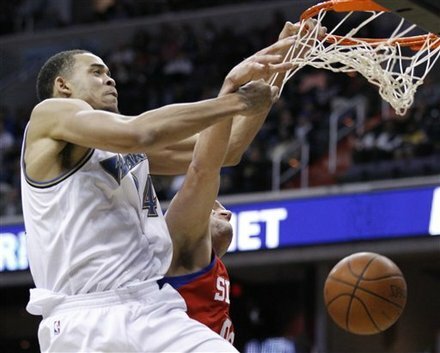 Javale McGee only made one basket last night, but he made it count. McGee, one of the most athletic big men in the league, received the pass from John Wall and threw a two handed hammer down on top of Spencer Hawes. Notice how quickly McGee got up off the floor on this play. That’s impressive. Honorable mention to Dwyane Wade.